Do you think your Honda NSX doesn't look aggressive enough? AIMGAIN thought so too and decided to do something about it – like give it a carbon fibre makeover in the form of this GT kit. Your Honda NSX is a pretty little thing, a real head turner, and that boosted V6 combined with its three electric motors and magical ECU voodoo delivers an exciting drive. But, as you walk towards it, you just feel like it's just not striking enough to look at. It's not a problem most of us have but, if you do, then well done we say. Fortunately, the guys from AIMGAIN can help you out. 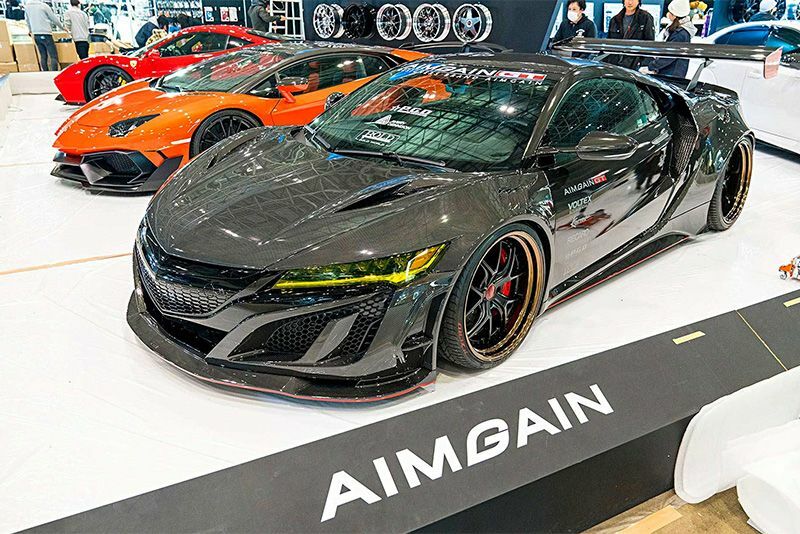 You see, they also felt the NSX could do with an aesthetic upgrade to give it more presence – like those dudes at the gym who stick steroid needles into their bum cheek – so they created what the call the AIMGAIN GT Carbon Fibre kit. For the somewhat pricey sum of roughly $45,500, they'll take your Honda flagship and apply a generous amount of carbon fibre to items like the front bumper and splitter, side skirts, rear spoiler and diffuser. The bonnet is new as is the boot sporting an air intake – all of which is also, you guessed it, carbon fibre. The fenders are also carbon fibre items, wider by 50mm in the front and 80mm at the back, which allow for wider wheels and tyres too – which, for all intents and purposes, makes the NSX look quite angry. There's no doubt these upgrades make the NSX look fantastic, it's a real fit-for-purpose kit that says what it does on the tin. The only issue is that it's only available in Japan at the moment.